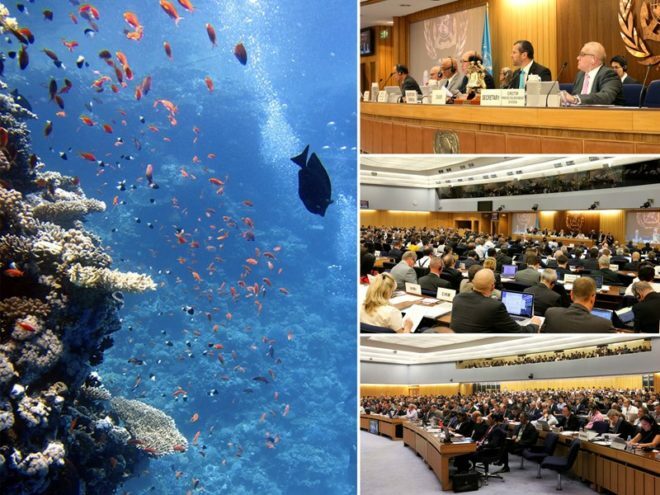 A busy Marine Environment Protection Committee (MEPC 71) is now under way at IMO Headquarters in London (3-7 July). A key item on the agenda is the implementation of the Ballast Water Management (BWM) Convention, which will enter into force on 8 September 2017. The Committee will consider draft amendments to the BWM Convention which will determine the implementation schedule for installations of ballast water management systems. Following ratification by Greece last week (on 26 June), the BWM Convention has been ratified by 60 countries, representing 68.46% of world merchant shipping tonnage. The Committee is also set to address the prevention of atmospheric pollution from ships, including the reduction of GHG emissions and the implementation of the 0.50% global sulphur limit for sulphur in fuel oil used on board ships. The MEPC was opened by Secretary-General Kitack Lim and is being chaired by Arsenio Dominguez (Panama). MEPC 71 is expected to continue its work relating to the implementation of the International Convention for the Control and Management of Ships’ Ballast Water and Sediments (BWM Convention), 2004, which will enter into force on 8 September 2017. Currently, the BWM Convention has been ratified by 60 countries, representing 68.46% of world merchant shipping tonnage. The MEPC will consider proposed draft amendments to the BWM Convention. Such amendments can only be circulated for adoption following entry into force of the treaty. It is intended that the draft amendments would be circulated by the Secretary-General immediately upon entry into force of the Convention, with a view to adoption by the Parties to the BWM Convention at the next MEPC session (MEPC 72) in spring 2018. The MEPC is expected to consider draft amendments to regulation B-3 (Ballast water management for ships) of the Convention relating to the time scale for implementation of regulations D-1 (Ballast water exchange standard) and D-2 (Ballast water performance standard). The draft amendments are expected to provide for the date of compliance with regulation D-2 of the Convention for existing ships to be linked to the date of the ship’s renewal survey. The MEPC will consider draft amendments to the BWM Convention which would make the 2016 Guidelines for approval of ballast water management systems (G8), adopted at the last session, mandatory in the form of a Code for approval of Ballast Water Management Systems, as agreed by MEPC 70. The MEPC is also expected to finalize draft revised circulars on Guidance on scaling of ballast water management systems (BWM.2/Circ.33) and Guidance for Administrations on the type approval process for ballast water management systems in accordance with Guidelines (G8) (BWM.2/Circ.43), which have been updated to reflect the 2016 Guidelines (G8) adopted at the last session. The MEPC is expected to finalize and approve the “Ballast Water Management – How to do it” manual, which provides advice and guidance on ratification, implementation and enforcement of the BWM Convention. The MEPC will consider proposed guidance on contingency measures as well as proposed guidance on application of the BWM Convention to ships operating in sea areas where ballast water exchange in accordance with regulation B-4 (Ballast water exchange) is not possible. The MEPC will consider, inter alia, revisions of the Guidelines for ballast water exchange (G6) and the Guidelines for risk assessment under regulation A-4 of the BWM Convention (G7). The MEPC will consider the report of a correspondence group tasked with developing a structured plan for data gathering and analysis of experience gained with the implementation of the BWM Convention and a proposed draft MEPC resolution on the matter. Draft guidance on methodologies that may be used for enumerating viable organisms will be considered by the MEPC for approval. The guidance provides information on methodologies used for enumerating viable organisms during the type approval of ballast water management systems and for enforcement purposes, in order to verify that they meet the ballast water performance standard described in regulation D-2 of the BWM Convention. Further ballast water management systems that make use of active substances will be considered for Basic and Final Approval, following consideration of the report of the 34th meeting of the Joint Group of Experts on the Scientific Aspects of Marine Environment Protection (GESAMP) Ballast Water Working Group. The current list of approved ballast water management systems can be found here. The MEPC is expected to continue to build on the solid work the Organization has undertaken to address greenhouse gas emissions from international shipping. Energy-efficiency design standards for new ships and associated operational energy-efficiency measures for existing ships became mandatory in 2013, with the entry into force of relevant amendments to MARPOL Annex VI. The Committee will be informed that nearly 2,500 new ocean-going ships have been certified as complying with the energy efficiency standards. The Intersessional Working Group on Reduction of GHG Emissions from Ships, which holds its first meeting 26-30 June, will provide a report to MEPC 71 which will form the basis for further deliberation in relation to the elements set out in the Roadmap for developing a comprehensive IMO strategy on reduction of GHG emissions from ships agreed at MEPC 70. An initial IMO GHG strategy is set to be adopted at MEPC 72 in spring 2018, including, inter alia, a list of candidate short-, mid- and long term further measures with possible timelines. Following the completion of the review of the status of technological developments relevant to implementing phase 2 of the EEDI requirements from 2020, the MEPC will consider a proposal to review the requirements for ro-ro cargo and ro-ro passenger ships. The MEPC will also consider the development of a possible methodology to review the EEDI requirements beyond phase 2. Other technical proposals under consideration relate to: minimum propulsion power to maintain the manoeuvrability of ships in adverse conditions; EEDI correction factors for ice class ships; and EEDI reduction factors for existing ships which have undergone major conversion. MARPOL amendments to make mandatory the data collection system for fuel oil consumption of ships were adopted at the last session and are expected to enter into force on 1 March 2018. They require data collection to start from calendar year 2019. MEPC 71 will consider draft guidelines on Administration data verification procedures and on the development and management of the IMO Ship Fuel Oil Consumption Database, developed by a correspondence group. It will also have for consideration a review conducted by the IMO Secretariat on technical and security issues identified with regard to the establishment of the database. The MEPC will continue its work to protect human health and the environment from air pollution from international shipping, including updating and implementation of the relevant regulations in MARPOL Annex VI. The MEPC is expected to consider for adoption draft amendments to designate the North Sea and the Baltic Sea as emission control areas (ECAs) for nitrogen oxides (NOX) under regulation 13 of MARPOL Annex VI. Both ECAs would take effect on 1 January 2021. Designation as a NOX ECA would require marine diesel engines to meet Tier III NOX emission levels when installed on ships constructed on or after 1 January 2021 and operating in the North Sea and the Baltic Sea. Further provisions, if adopted, would allow ships fitted with non-Tier III compliant marine diesel engines to be built, converted, repaired and/or maintained at shipyards located in the NOX Tier III ECAs. Both areas are already ECAs for control of emissions of sulphur oxides (SOX). The MEPC is expected to consider for adoption draft amendments to the information to be included in the bunker delivery note relating to the supply of marine fuel oil to ships which have fitted alternative mechanisms to address sulphur emissions requirements. This is aimed at addressing situations where the fuel oil supplied does not meet low sulphur requirements, but has been supplied to a ship which is using “equivalent means” (for example, abatement technology such as scrubbers) to reduce the SOx emissions of the ship in order to comply with MARPOL requirements. MEPC 70 decided that the global limit of the sulphur content of ships’ fuel oil will be 0.50% m/m from 1 January 2020. This limit is prescribed in regulation 14.1.3 of MARPOL Annex VI. MEPC 71 is expected to approve a proposed new output on “Consistent implementation of regulation 14.1.3 of MARPOL Annex VI” prepared by the Sub-Committee on Pollution Prevention and Response (PPR) at its fourth session, with a view to completion of the work by 2019. The proposed work would be aimed at exploring what actions may be taken to ensure consistent and effective implementation of the 0.50% m/m sulphur limit for fuel oil used by ships operating outside designated SOX Emission Control Areas and/or not making use of equivalent means such as Exhaust Gas Cleaning Systems, as well as actions that may facilitate the implementation of effective policies by IMO Member States. Regulation 14.3.1 of MARPOL Annex VI sets a 0.50% m/m limit of the sulphur content of fuel oil used onboard ships from 1 January 2020, down from 3.50% m/m currently. In emission control areas (ECAs) the limit is 0.10% m/m. MEPC 71 will consider, for adoption, draft Guidelines for the discharge of exhaust gas recirculation (EGR) bleed-off water. While the Guidelines are recommendatory in nature, Administrations are invited to base their implementation on them. Regulation 13.5.1 of MARPOL Annex VI requires marine diesel engines on certain ships operating in NOX ECAs to meet to meet Tier III NOX emission levels. EGR is an internal engine process resulting in NOX reduction. Bleed-off water should be handled differently, depending on the fuel oil sulphur content. EGR may also be used as a Tier II compliance option. MEPC 71 will consider, for adoption, draft 2017 Selective Catalytic Reduction (SCR) system Guidelines. Administrations will be invited to take these Guidelines into account when certifying engines fitted with SCR, a type of NOX-reducing device envisaged in the NOX Technical Code 2008 (NTC 2008). The MEPC will consider the final designation of the Tubbataha Reefs Natural Park, situated in the Sulu Sea, Philippines as a Particularly Sensitive Sea Area (PSSA), following the adoption by the Maritime Safety Committee of a new Area to be avoided as an associated protective measure. The aim is to reduce the risk of ship groundings in the park, thereby preventing any resulting marine pollution and damage to the fragile coral reef ecosystem, as well as ensuring the sustainability of local artisanal fisheries. The Committee will also consider a proposal by Malaysia to designate the Pulau Kukup (Kukup Island) and Tanjung Piai (Cape Piai) parks as a PSSA. The area is unique for its extensive mangroves and intertidal mudflats which support significant fisheries, aquaculture and tourism sectors. Proposals to establish an Area to be avoided and a Mandatory no anchoring area will be submitted to the next session of the Sub-Committee on Navigation, Communications and Search and Rescue (NCSR) for consideration as associated protective measures. The MEPC will consider a proposal to include a new output in its work programme to develop measures to reduce risks of use and carriage of heavy fuel oil (HFO) as fuel by ships in Arctic waters. The proposal, submitted by a number of countries, suggests consideration of a range of options, including ship design and equipment for both new and existing ships, operating constraints, and restricting or phasing out the use of particular types of fuels in all or parts of Arctic waters. The introduction of the 0.50% sulphur limit globally is anticipated to reduce the amount of heavy fuel oil used. But it is not expected to limit its use, since ships can be authorised by the flag State to use alternative means, such as scrubbers, to meet the sulphur limit. The MEPC is expected to adopt draft revised Guidelines for the implementation of MARPOL Annex V.
The revision incorporates amendments to the 2012 Guidelines concerning the application of criteria of the classification of solid bulk cargoes as harmful to the marine environment (HME) as well as a draft definition of E-waste. The proposed definition makes due reference to definitions developed by other Organizations, including the Basel Convention, the OECD and the European Commission. The draft revised guidelines also contain provisions for alignment with relevant requirements of the Polar Code. The MEPC will consider the draft Code for the transport and handling of hazardous and noxious liquid substances in bulk on offshore support vessels (OSV Chemical Code), prepared by PPR 4 and amended and approved by MSC 98, for concurrent approval and submission to the thirtieth IMO Assembly for adoption. The OSV Chemical Code aims to provide a consistent regulatory framework for the transport and handling of hazardous and noxious liquid substances in bulk on offshore support vessels, including a certification scheme, taking into account the complex and continued evolution of the offshore industry as well as the unique design features and service characteristics of these vessels. Draft updated IMO Model Courses on Oil Pollution Preparedness, Response and Cooperation (OPRC Model Training Courses), prepared by PPR 4, will be considered by the MEPC. The OPRC Model training courses have been revised to provide up to date guidance for preparedness and response to marine oil spills. There are four courses in the series, which comprise an Introductory Level – aimed at providing a general introduction and awareness to oil spill preparedness and response; Level 1 (Operational) – aimed at Team Leaders, First Responders and all those working in the field during a response; Level 2 (Tactical) – aimed at Incident Managers, On-Scene Commanders, Supervisors and those working in an incident command centre or managing a response operation; and Level 3 (Strategic) – aimed at administrators and senior managers with responsibility for determining preparedness levels and developing strategy in the response to a marine oil spill. The MEPC will be informed about recent developments with regard to major environment-related technical cooperation projects. With a view to continue the technical cooperation efforts in the marine biosafety area started with the GloBallast Partnerships Project, which came to an end in June 2017, IMO has secured further funding from the Global Environment Facility (GEF) to prepare a full-scale project document for a new global project aimed at assisting with the implementation of the IMO Guidelines for the control and management of ships’ biofouling. Furthermore, the European Union-funded Global MTCC Network (GMN) Project has successfully established maritime technology cooperation centres (MTTC) in the five target regions Asia, Africa, Caribbean, Latin America and Pacific. With the goal to support the move towards low-carbon shipping, the MTTCs will focus on capacity building efforts and implementation of pilot projects involving fuel oil consumption data collection and low-carbon technologies in the regions.